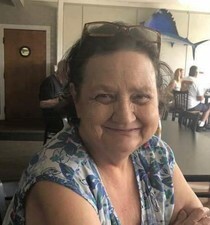 Lela Michelle Castle Jarrard, age 59, of 1799 Stephentown Rd., Blanch, passed away on Sunday, September 9, 2018 at her home. Born in St. Clair, Illinois, she was the daughter of the late Thomas Allen Castle and Lucy Nelle Maddox Redd. Ms. Jarrard was a homemaker and of the Christian faith. She had a great love for children and animals and loved spending time with her family. Surviving are her daughter Beverly Ballou (Aaron) of Shallotte; six sisters, Venna K.Wood (Chester Hersey) of Burlington, April Delgado of Pelham, Tiara Timmerman (David) of Windsor, SC, Wendy Rigsbee (Mike) of Carolina Beach, Mitzie Castle of Timberlake, Tonia Manzulich (Paul) of Durham; one brother, Thomas Allen Castle, II of Roxboro; stepmother Donna Kaye Bass of Timberlake; stepmother Shelby Oakley Castle of Roxboro; one granddaughter, Abigail Ballou; stepbrother, Pete Oakley (Tina) of Roxboro; stepsister Angela Barber (Jerry) of Roxboro; fur baby, Novack; twenty-eight nieces and nephews; and a host of great nieces and nephews. Memorial Services will be held 2PM Saturday, September 15, 2018 at Harrelson Funeral Services Chapel by Rev. Britt Groom. The family will receive friends following the service at the Funeral Home and other times at the home. Because of Lela’s love for animals, she requested in lieu of flowers, memorials may be made to a local animal shelter of one’s choosing. May you find comfort in knowing that your dear one is safe in the memory of God, who will remember every detail about him and bring him back again.”As the last enemy, death is to be brought to nothing.”—1 Corinthians 15:26.